Must humans be stupid and wrongheaded? Not if they take greater pains to shape their environments and understand what’s going on inside their heads. The human mind lives in the past, present, and future all at once, writes Bargh (Psychology/Yale Univ. ; co-editor: Oxford Handbook of Human Action, 2009, etc. ), and it may not be trustworthy in any of those temporal dimensions. If we form decisions in less than the wink of an eye, our hidden assumptions, prejudices, and interpretations mean “that ‘blink’ responses are in fact considerably more fallible than many of us think.” Sometimes those hidden aspects of mind are just this side of inexplicable; why, for instance, should someone who, fearing the flu, cleans his or her hands form a more positive view of immigration than someone whose hands remain unwashed? If anything, writes the author, such things suggest that we are wrong to think that “our thinking emerges only from rational principles and ideologies.” As Bargh notes, given the monstrous thinking that so many children soak up from so many adults, it’s a wonder that we can live in the world at all. It’s refreshing that after so much biology-oriented neuroscience, the author isn’t afraid to look at the nurture side of the nature/nurture divide. 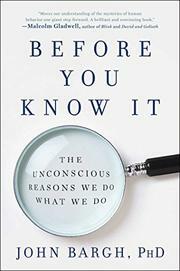 So it is that people can be trained to change their minds: to examine and retool biases and snap judgments as if acquiring a new good habit—no stretch there, for Bargh observes that just as smoking has been reduced by making environmental changes that make it harder to smoke, it’s possible to alter environments to make people cultivate better habits of mind. “If you want to be less racist and sexist,” he writes, “then use implementation intentions such as ‘When I see a person of color, I will remind myself to be fair!’ ” That may seem a touch Pollyannaish, but it’s backed by interesting science and experimental findings, all ably reported. Pop and academic science with a dose of self-help, all rolled up into a satisfying package.